After spending the last eight years as sustainability manager with Tridel, overseeing LEED certification and energy efficiency programs for Canada's largest condo development company, Rambod Nasrin has lately become a real estate developer in his own right. He has set his sights on rebuilding and restoring old homes in Toronto's Leslieville district, in the same area as this century-old house on historic Ashdale Avenue. Purchased in November, 2010 for $394,000 as a home for himself and his young family, the house needed work. “It was in extremely poor condition and required immediate attention and vision,” Mr. Nasrin said. 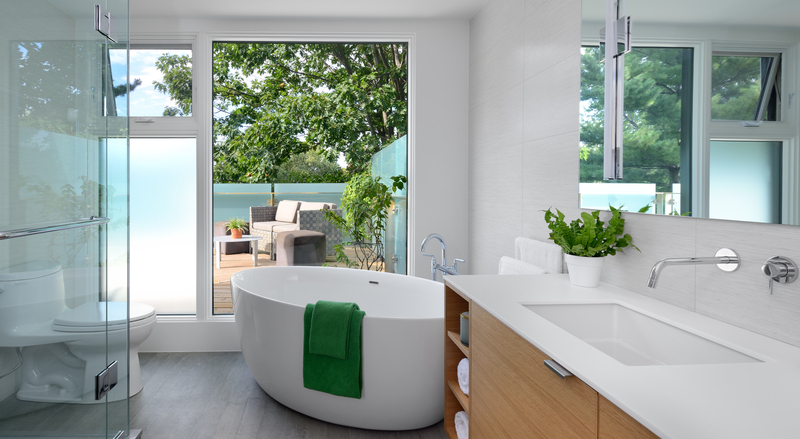 The challenge lay in taking a two-storey semi with three small bedrooms and one minuscule bathroom and converting it into an energy efficient and stylish 2+1 bedroom home outfitted with all the latest modern conveniences. “This was designed and built as a custom home in collaboration with an architect. It took seven months and $350,000 to rebuild,” he said. Nothing was spared in the renovation; all that's remaining from the original house is the vintage fireplace mantel and antique wooden doors. “It was a total gut,” says Mr. Nasrin. The foundations were underpinned and waterproofed, the joists reinforced and staircases widened. A previous addition was completely rebuilt with the introduction of new windows, skylights, as well as mechanical, electrical and plumbing. Also new is a modern floating staircase, a marble-clad bathroom, and four decks and terraces overlooking both backyard and front featuring custom landscaping. The family room features a built-in sound system and custom mill work while the kitchen sports quartz countertops and the latest stainless steel appliances. The house was rated by Natural Resources Canada to have improved from a 24 rating to an impressive 76, which Mr. Nasrin says is better than what's usually accorded newly-built homes. Mr. Nasrin designed his home on a European model, creating a series of inter-connecting, open-concept rooms with optimum spatial flow. But his favourite feature is the century-old stonework that formed the foundation of the old house. When renovating, he rebuilt it and it now serves as a natural textural element in the newly finished basement where there's a family room, washroom and home office.